Austrian artist Oliver Ressler has been researching issues such as economics, democracy, forms of resistence and social alternatives. Between 2003 and 2008, Oliver Ressler has been working on an extensive project, “Alternative Economics, Alternative Societies”. The project focuses on diverse concepts and models for alternative economies and societies, all of which reject the capitalist system of rule. As a part of the project, Ressler has interviewed a variety of people, including economists, political scientists, authors and historians. The 16 interviews corresponding to the 16 main concepts were turned into a video installation, which has been shown in 21 countries so far. “Alternative Economics, Alternative Societies” turns against the idea that reflection on alternative forms of social organization can only happen in the form of historical research. At the beginning of the 21st century, it is no longer possible to talk about “the” alternative – which socialism was for many people in the 20th century – but about a whole bundle of measurements, initiatives, adjustments, counter-strategies and models. The project “Alternative Economics, Alternative Societies” understands the breakaway from clear orientation as an opportunity: It assembles elaborated descriptions of models of organization for alternative societies and economies as well as concrete historical experiences. In the workshop, Ressler will present excerpts of the videos. The workshop will mainly consist of critical dialogue and shared discussions that aim to find ways to achieve the above-mentioned social and political changes. Over the past decade, Oliver Ressler has developed a body of work related to the alter-globalization movement. In his talk, Ressler will present his most recent work on the latest social movements, the 3-channel video installation “Take The Square”. The project focuses on mass movements that have taken place on various squares around the world; movements, where people began to opposed and fight the massive increase in social inequality and the dismantling of democracy in times of global financial and economic crisis. The movements of the squares are non-hierarchical and reject representation; direct democracy shapes their activities. The occupation of public places serves as a catalyst for developing demonstrations, general strikes, meetings and working groups at different locations. Successful site occupations in one place often inspire occupations in other cities, without a linear relationship. 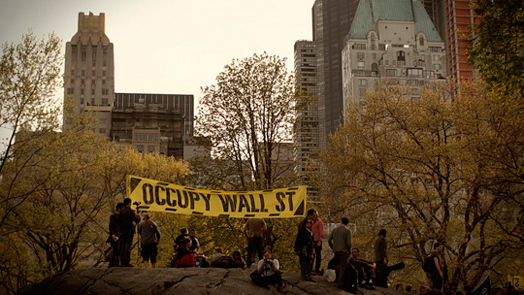 The 3-channel video installation “Take The Square” is based on discussions conducted with activists from 15M in Madrid, the Syntagma Square movement in Athens and Occupy Wall Street in New York.